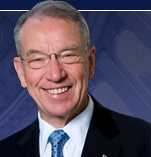 Sen. Chuck Grassley Critical of Housing Guantanamo Inmates in Ill.
WASHINGTON — As expected, not everyone is happy with the Obama Administration’s decision to house Guantanamo Bay prisoners at a correctional facility in Thomson, Ill., about a two hours drive from Chicago. The White House announced on Tuesday that it planned to purchase the facility and also hold military trials there. “I don’t agree with bringing terrorists anywhere in the United States, let alone a stone’s throw from Iowa. There are a number of serious concerns with moving these terrorists to United States soil, including the legal, immigration and constitutional rights they will be afforded, along with a host of national security concerns and risks that would obviously come with moving people to the heartland who wish to kill Americans. Posted: 12/15/09 at 5:50 PM under News Story.